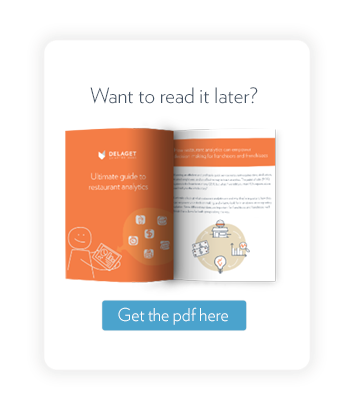 Why should you review your restaurant analytics? What software should you have? How can restaurant analytics empower your decision making? Running an efficient and profitable quick service restaurant requires time, dedication, trusted employees, and an effective way to track analytics. The point of sale (POS) system is the heartbeat of any QSR, but what if we told you that POS reports alone can’t tell you the whole story? Let’s take a look at what restaurant analytics are and why they’re important, how they can empower your decision making, and what to look for in an above-store reporting solution. Since different numbers are important for franchisees and franchisors, we’ll break them down for both groups along the way. Restaurant analytics include the collection, consolidation, and analysis of data from all your various systems, from POS and back of house, to drive thru timers and customer survey results. Analytics are used to check the efficiency, speed, profitability, and productivity of your operations and employees. This information can help you increase sales, enhance guest satisfaction, optimize labor and food costs, and prevent loss. Builds a transparent work environment for your employees. Providing a daily analytics report card to your team opens lines of communication and allows everyone to recognize potential opportunities to address gaps in operations. Keeps your team focused on results. This allows your employees the opportunity to strive for better results and help your business improve. Is easier to track emphasis points and special promotions. Your team shouldn’t be focused on the same thing year-round. In fact, each week or month, they’ll have different areas of the business to focus on, whether it’s new corporate initiatives or promoted products. Understanding the data day-in and day-out will help you determine which area requires your team’s attention. Provides insight into employee performance. You’ll have a deeper understanding of how your employees are performing, where problems are occurring and where training is needed. The ability to rank employees and see how individuals are performing against key metrics (i.e. how many voids has an employee given over a specific time period) can be very impactful in regards to training, scheduling, promotion, or termination decisions. Leads to more intelligence. Over time, daily analytics shed light on trends, which helps you create more specific forecasts. Can earn you a better bonus. Stay on top of your numbers, and you’ll better understand where you are in relation to your goals. With accurate, ongoing reporting and tracking, you can prove that you’re an expert in running your QSR. Ultimately, this could help you earn more money. Of course, collecting data isn’t possible without software. Whether you’re a franchisee or franchisor, data is crucial to running a successful operation. Fortunately, there are various restaurant software solutions to help you keep your finger on the pulse of your business. The number one component to your front of house operations is your POS system, which includes credit card terminals and kiosks. The back of house handles a lot, so your system must be able to take on operations metrics, sales forecasting and scheduling, cash reconciliation, inventory systems, food and supply ordering, and employee information. It would be impossible to run a restaurant without the help of your staff, so ensure your human resources software supports hiring, onboarding, training, promotion, and termination. Software that allows you to gain customer feedback is essential to the success of your business. Often called “voice of the customer,” this software lets you know what your customers think, like and don’t like. Above-store reporting software allows you to get the whole picture. It combines all of the insight from the software listed above into a centralized dashboard. This makes it simple to compare information across multiple restaurants and make smarter, data-driven decisions. Not only are analytics important for tracking the performance of your restaurants and staff, but they help you make better informed decisions to improve service and enhance guest experience. Depending on your role within the industry — franchisee or franchisor, you may use different analytics to empower your decisions. Franchisees use analytics to enhance every aspect of their stores — from sales, labor, and speed of service, to food cost and loss prevention. Sales: Your POS system reports all your financial transactions from sales, deletions, voids, over-rings, etc. This information helps you track revenue, sales, employee performance, and the overall condition of your business. While these reports are vital to your business, your POS may not be enough. You may also look to demographics to gain insight into sales and your target market, but customer behavior can tell you a lot more about your clientele and sales than numbers or identifiers ever will. Labor: A labor cost report tells you what each employee earns. It can be split into front of house and back of house or hourly and salary. This report helps you balance managers hours, control overtime, implement a business-first schedule, and maximize sales. You can even find patterns between specific employees and their productivity. For example, you may want to recommend that two certain people work together because when Ben and Jenny work together, sales are up. For tips to better control labor cost at your QSR, check out our article. Speed of service: Speed of service tells you how quickly your staff is serving orders whether in store or through the drive thru. This type of report can shed light on slow times of the day or unproductive employees, which helps you more accurately forecast sales and schedule the right people for the right roles. Learn how to improve speed of service or focus on the best metrics to measure employee productivity by visiting our blog page. Food cost: A food cost report tracks what you pay for raw materials and gross profit percentage. It helps you calculate what percentage of the your total revenues was food cost. Unfortunately, food waste is a big issue in the restaurant industry, so it’s important that you identify ways to prevent food waste at your QSRs. Investigate more ways to enhance your restaurant using inventory and COGS procedures in one of our articles. Loss prevention: Beyond food waste, there are a number of ways franchisees experience loss — one of the biggest being employee theft. Above store reporting helps franchisees track employee performance in a way that will bring light to deletions/cancelled orders, discounts, over-rings/voids, and refunds. If an issue arises, you may want to provide more training or install surveillance cameras. Find more loss prevention tips to keep you in the black in our article. Guest experience: Many analytics have the potential to impact guest experience. For example, if the speed of service is slow, customers will grow impatient and frustrated. If your labor report has a gap, it could mean your restaurant was short-handed, which could negatively impact your customers. Above store reporting draws attention to gaps in analytics, which, in turn, helps you make changes such as ensuring you schedule the right amount of employees to adequately staff your restaurant during its busiest times. Franchisors deal with a different set of responsibilities, decisions, and tracked data such as operational processes, guest experience, and supplier relations. In particular, franchisors are focused on growing units, increasing same-store sales. collecting more data on guests so they can understand their needs, attracting new franchisees, and discovering new technology initiatives, like mobile ordering and delivery. Franchisee cooperation: When franchisees understand the data and the goals of the overall organization, they can enhance their strategies for both short-term and long-term business goals. With access to data, franchisors can give benchmarks to the franchisees that they should be hitting for profitability, and can give advice on how they should be marketing their stores. Franchisee success helps to grow the success of the franchisor, resulting in increasing royalty fees and support of the franchisor’s continuous growth objective. Promotional research: Franchisors use data to ensure that promotions are profitable for the franchisee. They also confirm that sales are occuring on a weekly, period, quarterly, and annual basis. Data allows franchisors to review guest surveys to learn which franchisees are successful (or unsuccessful) at taking care of customers. Operational processes: Did you know above store reporting can help identify the need for operational process changes? Well, it can. Above store reporting can help identify issues with speed of service, sales and comparable transactions, and voice of customer, all of which would lead to changes in operational processes if deemed serious enough. Improve supplier relations: Maintaining a positive relationship with your suppliers is vital to the success of your business. Forecasting, food orders, and supplier follow-up all help nurture that relationship. If there is an issue in any of these areas, you know something needs to be done to mend the relationship. To remedy, you can ensure that you check your order upon arrival, meet the deadline if something on your order was incorrect, and accurately forecasting for future orders. Cloud access — A cloud-based solution means you have access to reports from anywhere. Multiple account levels and access options — Different employees need access to different reports, so it’s crucial that your system allows you to grant permissions for each user. Consistent data formats across multiple brands — Analyzing data is easiest when your reports are standardized across brands. Accessibility across devices — You’re busy and so is your team. It’s safe to assume your employees will access reports from tablets and smartphones, not just their computer. An above-store reporting solution that accounts for that is valuable. Easy-to-use and easy-to-read reporting — You’ll want a reporting solution that allows your team to easily export, edit, and comment on reports. Report subscriptions — Wouldn’t it be nice to have a specific report automatically sent directly to your inbox? Some tools allow that. Configuration options — configuration options provide the flexibility to customize the complexity of your reports. An above store reporting solution, like Delaget Stats, may be your answer to running a smarter operation. And when you run a smarter operation, you’re more successful. Ready to see what Delaget solutions can do for you?